Whether on business or vacation, come experience our colonial charm, warm hospitality, comfort and convenience - your host Bridget Timpany welcomes you to Over the Topp Bed & Breakfast. Situated in the upmarket Durban North suburb, 'Over the Topp', which is NAA accredited is very conveniently placed for easy access to Durban's beaches, shopping malls and the many attractions that this holiday city of Durban is renowned to have. Over the Topp B&B provides 4 en-suite rooms, all of which contain a breakfast bar with fridge, tea/coffee facilities, and colour television. A barbeque area is also available to enjoy a good day in the sun, with a swimming pool close at hand to cool off the day after visiting our local beaches (Umhlanga Rocks and Durban), which are with a short drive from us. We have secure parking behind electronic garage doors. 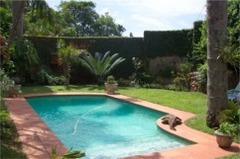 close to Umhlanga and CBD, Gateway and Pavilion. Cancellation : Due to the tremendous inconvenience and loss of business incurred, we unfortunately have to charge a 100% default fee on all cancellations that are not received at least 72 hours in advance. 50% default fee on all cancellations that are not received 10 days in advance. Full accommodation rates are payable on all no-shows. We regret that there can be no concessions. Policies : No smoking in units, however smoking is permitted outdoors. Take third glide off after Spaghetti Junction, Kwa Mashu turnoff, keep on middle lane, turn right at traffic lights and go under the bridge, you are now on Chris Hani (North Coast Road), continue for about + - 3 km. Turn first left into Old Mill Way (at Engen Garage), continue along Old Mill Way to traffic light.